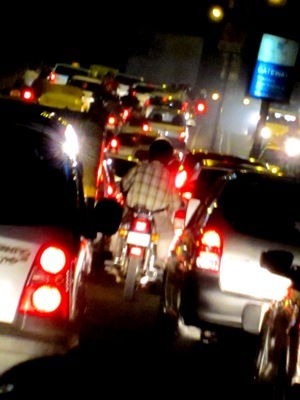 Over a year ago, I posted a funny-but-true piece about driving in India. I remembered that article recently when I spent some time in Bangalore, or as it now calls itself, Bengaluru. This is a city I’ve been visiting for years since the late 1970s, as it transformed from a bucolic garden city to the chaotic urbanism of today. These days, Bangalore is an extensive building site, with new multistoreyed developments coming up, an underground metropolitan railway under construction, half-built overpasses, and excavated roads. Many of the streets are narrow neighborhood roads, built at a time when cars were scarce and parking seemed a waste of space. Amid all this is the traffic: cars and trucks, motor-bikes and scooters, auto-rickshaws and cyclists, and a few stray dogs and cats and cows (though far fewer than I saw in Delhi). Accustomed to the orderly-even-when-clogged traffic flows of the US, I found the chaos of the traffic annoying at first, especially when stuck in it. The only rule the traffic followed with any consistency was stopping at the red light. Beyond that, it wasn’t that drivers violated traffic rules, it was evident that de facto, there were no rules. Then, as I observed it, it seemed… familiar. That’s when I realized — the traffic moves organically, like a migrating herd of animals. It seeks possibilities and general directions. Drivers look for openings they can move into, while being aware of a limited personal space around other vehicles. They indicate their intentions by starting the move, rather than by using mechanical signals. And, like animals in a herd, they can be noisy; the extended loud honking of trucks, the irritable buzzing of auto-rickshaws, the ringtones of reversing vehicles. The horn is a communication device, and they are no shyer about using them than a flock of geese settling on a lake. 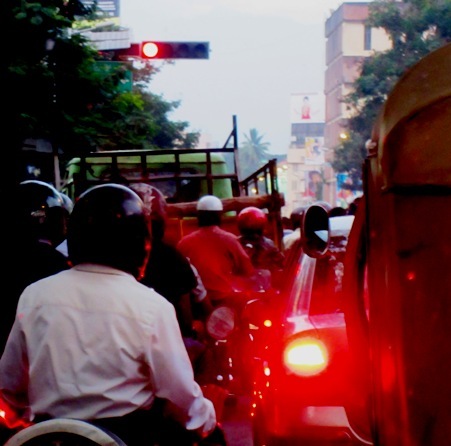 This entry was posted in Doing Business in India, General, Infrastructure and tagged Bangalore, Bengaluru, cars, driving, traffic. Bookmark the permalink. I like the idea that has evolved from your patient observations – the traffic is moving ahead like a herd – so organic yet not quite catastrophic. Brilliant, Rupa. If I may add, the one big difference is that animals will pause to help one of their own, in case of need. Here, I have to reach, so who cares what happens to someone else.